To me, the Super Bowl is just a big excuse to eat appetizers all day long, and that’s why I like it. 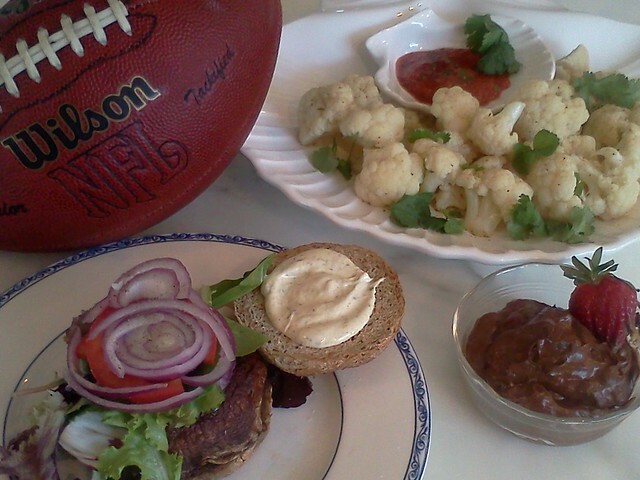 I’m not much of a sports fan, so the highlight for me is coming up with the menu and putting it all together. This year, we asked our Editors and our Facebook and Twitter friends to give us a list of their favorite Football watching fare. Go ahead, loosen your belt and dive right in. Oh, but we do offer some vegetarian alternatives like Jennifer Malme’s Spicy Baked Chickpeas and Michele Errechetti’s Unshrimp Cocktail and Raw Avocado Chocolate Mousse. (We’ll just have to trust her on that one.) 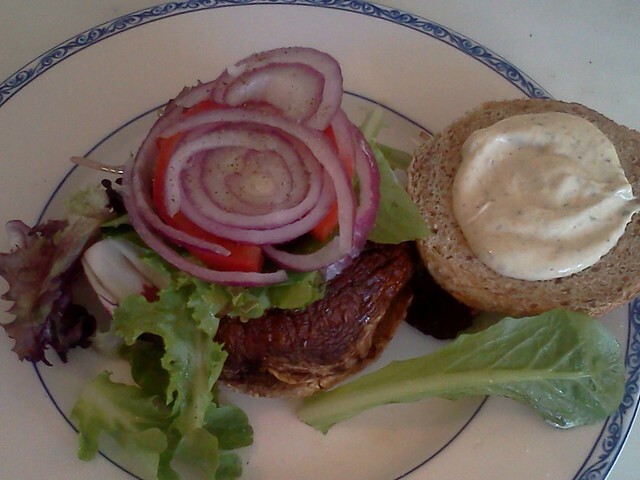 Our lead picture is thanks to Michele’s dive into the vegetarian side. Thanks Michele. Use your favorite Pulled Pork recipe. Then load each individual tortilla chip with a spoon full of the pork and a little shredded cheddar. Pop them in the oven for a few minutes and then finish off with a dollop of cole slaw. Warning, they are highly addictive. Here’s my PP recipe. You could even use store bought in a pinch. 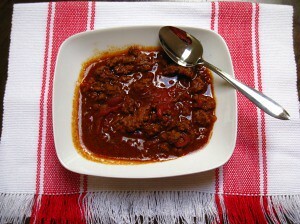 This simple and delicious chili recipe makes enough to feed an army…or at least 15 of your friends at your next party. Sauté onion, and garlic on high heat for 5 minutes. Add beef and cook until cooked through and no longer pink, about 8 minutes. Add Worcestershire sauce. Sauté until completely gray in color. Add spices and blend well. Add beans and tomatoes. Cook on low heat for 1-2 hours. Preheat the oven to 400 degrees F. Rinse the chickpeas with cool water and drain in a colander. Dry chickpeas by rolling them in a clean kitchen towel. Combine the oil, paprika, cumin, pepper, and salt in a large bowl. Add chickpeas and toss to coat evenly. Transfer the chickpeas to a parchment-lined baking sheet and spread them out in a single layer. Bake until golden and crispy, 30 to 35 minutes, shaking the tray to toss after 15 minutes. Remove the baking sheet from the oven and transfer the chickpeas to a serving bowl. These are great for game day, parties, even in a packed lunch in place of chips. They can be stored for several days in an air-tight container at room temperature – if you have any left! Here is the recipe for our award-winning Super Bowl snack! Take small ramekins and place in large roasting pan. Spray ramekins with PAM. Heat a saute pan. Split the chorizo sausage casing down the middle and remove the casing. Drop the sausage into the pan and break up. Cook thoroughly. Using an upside down glass bowl, cut tortillas to fit ramekins and place one in each ramekin. Bake tortillas for 10 minutes. Remove from oven. Move rack to top level and set your oven to broil. While tortillas are still warm, spread approximately 1 tablespoon of refried beans on bottom of each tortilla. Next, add about a tablespoon of cooked chorizo, followed by a tablespoon of Ro-tel Tomatoes and Green Chilies, and cover with small handful of shredded cheese. Slide pan of ramekins under broiler and broil for approximately 2 minutes. Watch carefully. Remove from oven when tortillas are crisp and brown around edges. Remove tortillas from ramekins, arrange on serving platter. Top with a dollop of guacamole and sour cream. Enjoy! 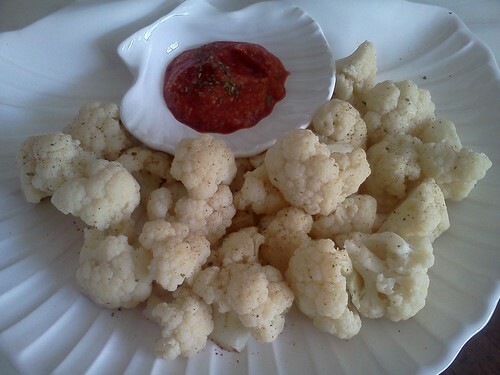 Clean and cut cauliflower into approximately 2 inch florets. Squeeze lemons into pot and add lemon halves and combine all ingredients except cauliflower into a large (12 quart pot ). Bring to boil for 10 minutes to meld flavors. Add cauliflower and turn off heat. Cover tightly for 5 to 10 minutes until fork tender, but firm. Remove cauliflower with slotted spoon and drain on dish to cool. You can make and refrigerate up to a day ahead. Serve with cocktail sauce. Basically ketchup and horseradish, you can add a splash of Tabasco for more heat. Warning: You may hear moaning at first, but I bet there will nothing but lips smacking after the first bite. Add all ingredients into food processor starting with peeled avocados and blend until smooth. You may garnish with fruit or plain Greek yogurt drizzled with honey as “whipped cream” . Let your imagination go! We also asked our Facebook and Twitter friends what they’d be serving. Here are some standouts we thought we’d mention. Brown ground beef; drain fat. Stir in Chipotle Queso Dip Starter and cubed cheese; stir over low heat until cheese melts. Spoon warm cheese mixture over Blue Aztec Chips on a large platter; garnish with tomatoes and jalapenos. Makes 16-20 servings. Elmina, another Facebook Fan gave us the whole run down. We already discussed this in our household: here we go…#1) Ground lamb sliders with a feta cheese spread and cucumber relish, #2) Homemade Jalapeno poppers with goat cheese, #3) Traditional wings, #4) Pigs in a blanket made with chorizo and creole mustard for dipping! Can’t wait! Oh, Elmina, we’re comin’ over. What are your favorite Super Bowl recipes? Feel free to share them in a comment below or Join in the Fun with your fellow Biters on Facebook and Twitter. Go Giants! !